A new study from the National Institute for Occupational Safety and Health (NIOSH) shows many nurses report not wearing protective gloves or gowns when administering cancer medications to patients. The drugs can be administered in pill or liquid form and work to kill rapidly dividing cancerous cells; however, the drugs also can be harmful to the healthy cells of the nurse, including the cells of a developing baby. Data were collected from more than 40,000 nurses participating in a web-based survey of U.S. and Canadian nurses. Non-pregnant nurses reported their use of gloves and gowns when handling or administering antineoplastic (medications used to treat cancer) drugs within the past month, and pregnant nurses reported their use during the first 20 weeks of pregnancy, a time during which the fetus is highly susceptible to exposure. The study showed that despite long-standing recommendations for the safe handling of antineoplastic and other hazardous drugs, many nurses – including those who are pregnant – reported not wearing protective gloves and gowns, the minimum protective equipment recommended when administering these drugs. Twelve percent of non-pregnant nurses and 9 percent of pregnant nurses indicated that they never wore gloves when administering antineoplastic drugs. Forty-two percent of non-pregnant nurses and 38 percent of pregnant nurses reported never using a gown. During the first 20 weeks of pregnancy, about one in 10 pregnant nurses did not always wear gloves and one in two did not always wear a protective gown when administering these drugs. Researchers said reasons for not wearing PPE may include nurses prioritizing care for patients over their own health, lack of concern or awareness by either employee or employer of the drugs’ toxicity, and availability or opportunity to wear protective gloves and gowns. 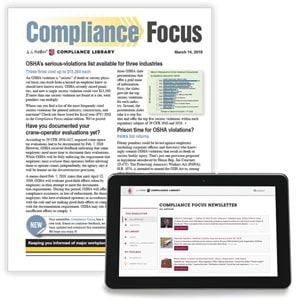 J. J. Keller's Compliance Focus helps you stay on top of critical regulatory developments from: DOT, OSHA, EPA, DOL, MSHA, EEOC, DHS and other agencies.